Christmas Eve is tomorrow. EEEEEKKK!!! 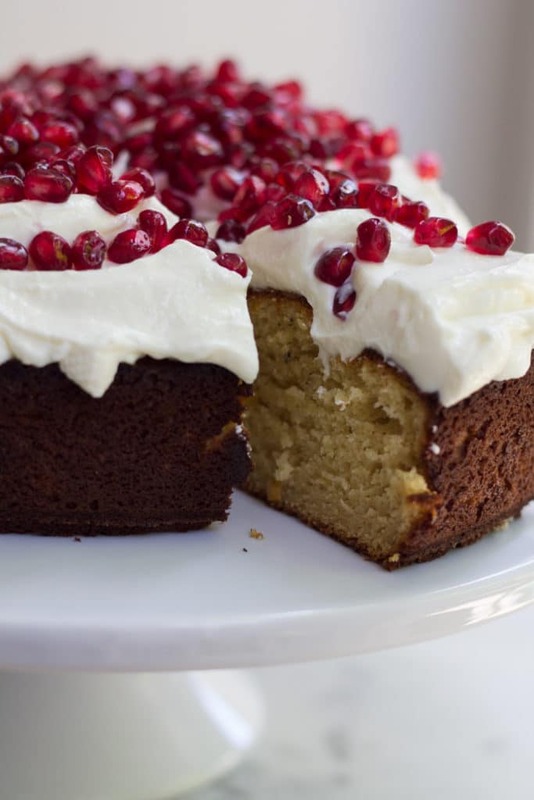 As always, I have left everything to the last minute for Christmas…including this blog post on Honey, Orange and Cardamom Cake with Yoghurt and Pomegranate. All the websites giving advice on blogging suggest that you should be pumping out the Holiday themed posts about three to four weeks before the actual Holidays so technically this should be a New Year’s Eve post, well actually I really should have already done that and be onto January summer entertaining. Just like this blog post I have also left making my Christmas cakes to the last minute…yup, did them just a few days ago…writing my Christmas cards…they were sent yesterday which I had of course expertly coordinated with the FastPost cut off date…and of course my Christmas present shopping…I have a few more things to buy tomorrow. Eeek! I know, tomorrow is Christmas Eve and we all know just how utterly chaotic and manic the shops will be tomorrow. However, I claim that I have made a conscious decision to actually go shopping tomorrow because it was either go shopping with two little boys (a one year old and a three year old) or wait until Daddy can look after them and go during the mania of Christmas Eve. Yes, hand’s down any mother wanting to retain their sanity would choose Christmas Eve shopping! 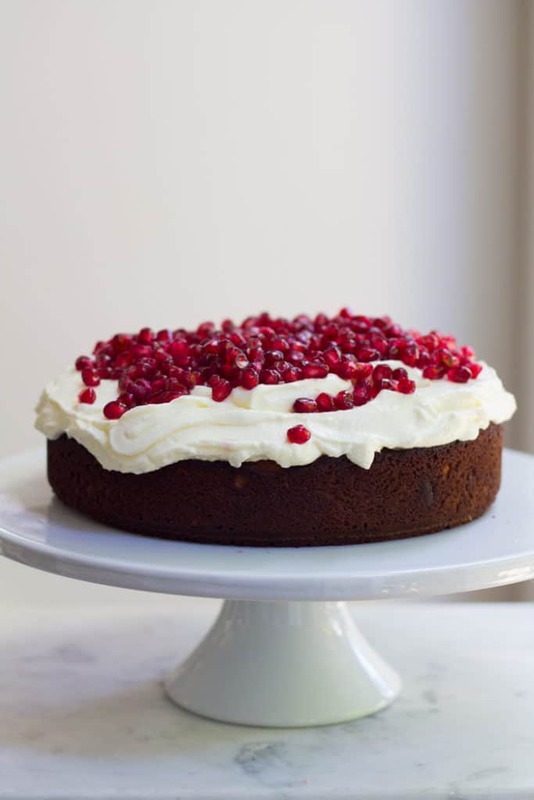 So I know this post is last minute and you’ve probably already done all your Christmas baking (or buying! I totally endorse the low stress option!) or at least planned what you’re doing for Christmas Day or your Holiday, but I still wanted to post this. 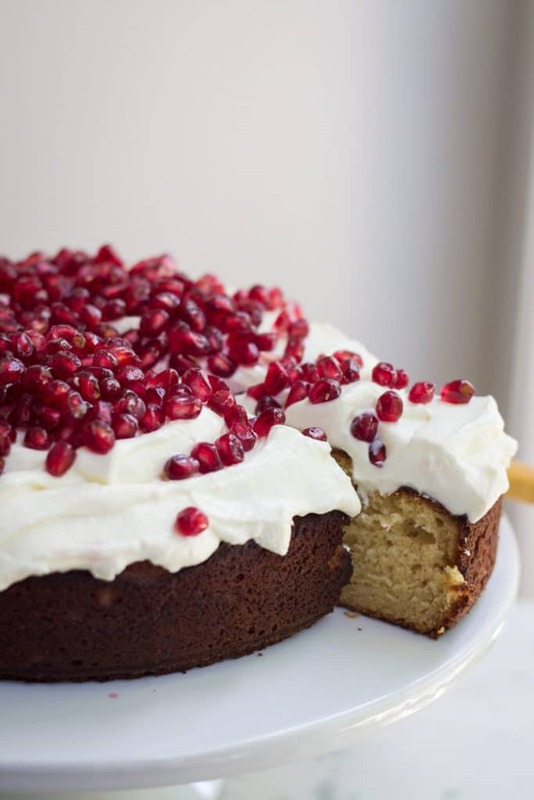 My Honey, Orange and Cardamom Cake with Yoghurt and Pomegranate does have a bit of a festive flair to it but it really is good anytime of year. I love to make it in the late summer when those prized fresh figs with rosy pink centres are around replacing the pomegranates with figs and drizzling over some fragrant runny honey. If you are like me and everything is last minute (I do blame the fact I have two small children but to tell you the truth, and my parents will agree, I am well known for leaving things to the last minute, not quite as bad as my husband who’s mantra is “Work fills the time available for it’s completion” and who completed his MBA thesis in the weekend before it was due…we are well suited)…anyway, if you are like me and everything is last minute then here’s an easy, healthy and fresh take on a Holiday dessert you might like to make this year. 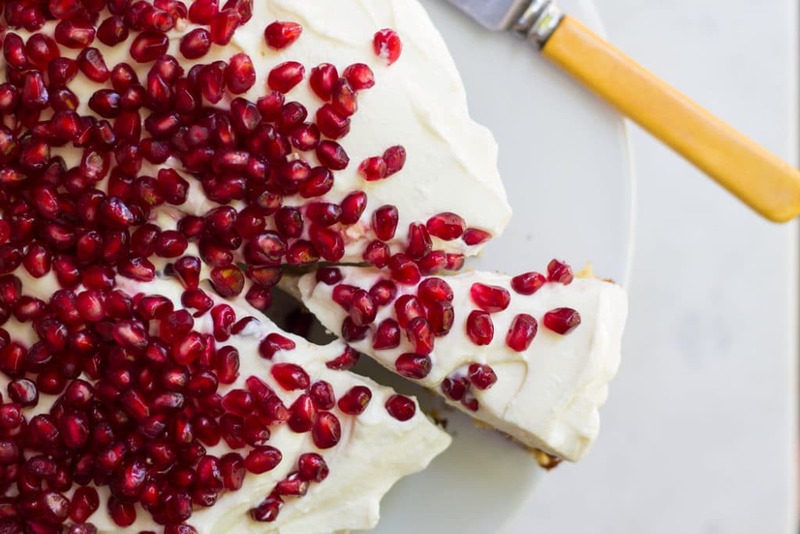 Ingredients are easy to find (all in the supermarket) and it’s quick and simple to put together so it’s the perfect last minute dessert for your Holiday feast. It is slightly different to your traditional fruit mince filled pudding, tarts or cake – I like to think of it as a modern take on the classic. The honey, oranges and cardamom are all so fragrant and taste so delightful together and with the thick yoghurt dolloped on top and the little pomegranate jewels makes you think you might even be sitting in a little cafe under the warm Mediterranean sun relaxing with a slice of cake and of course a strong little espresso. Sorry, no more time to chat my gorgeous friends…last minute things to do. I hope you all have a gorgeous celebration with your friends and family. Preheat oven to 180C/350F on fan-bake. Grease and line 1 x 20cm/8in round cake tin. Place honey in a small saucepan over medium heat. Bring to a simmer and allow to simmer for about 3-4 minutes until it darkens slightly. Remove from the heat and stir in the orange zest, juice and ground cardamom seeds. Set aside to cool slightly. 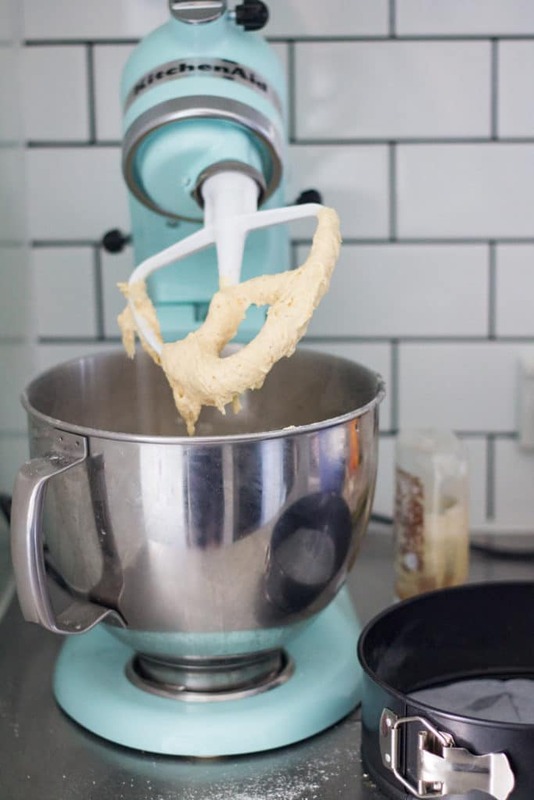 Whisk together the flour, almonds, baking powder and sea salt in a medium bowl and set aside. 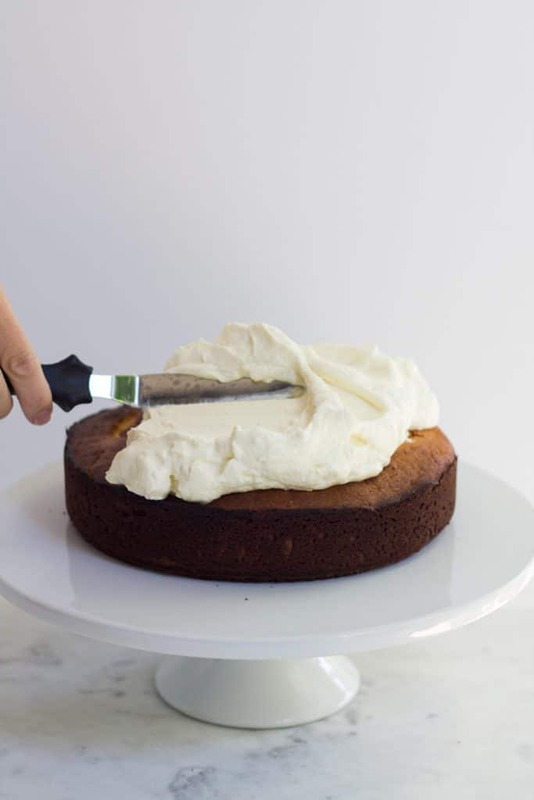 Using a standing electric mixer (or by hand) cream the butter and sugar until pale and fluffy. Add the eggs one at a time ensuring they are incorporated after each addition. If the mixture looks like it has curdled, and it generally does with this recipe because there’s not much sugar in it, add 1 Tbsp of the dry flour mixture after each egg. Add half the flour mixture and mix to incorporate. Add 2/3 cup thick natural yoghurt and honey and orange mixture. Mix to combine then add the remaining flour mixture and mix until just combined. Try not to over mix. Bake for 25-30 min or until a skewer comes out clean when inserted into the cake. Remove from oven and allow to cool in the tin for 10 min before turning out on a wire rack and allowing to cook completely. 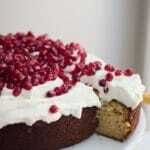 Top with the thick Greek yoghurt (see note 2) and top with a sprinkling of pomegranate seeds. Note 1. You can buy cardamom already ground. However, if you can't find this then buy the green cardamom pods. Take the black seeds out and discard the green outer shell. 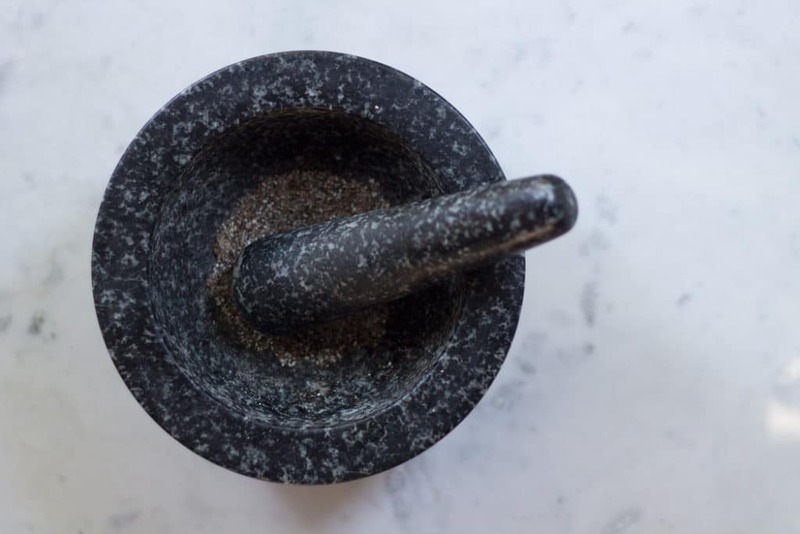 Grind the black seeds in a mortar and pestle or spice grinder until finely ground. I actually prefer to do it this way because I find it more fragrant, but the pre-ground option is a great shortcut! Note 2. 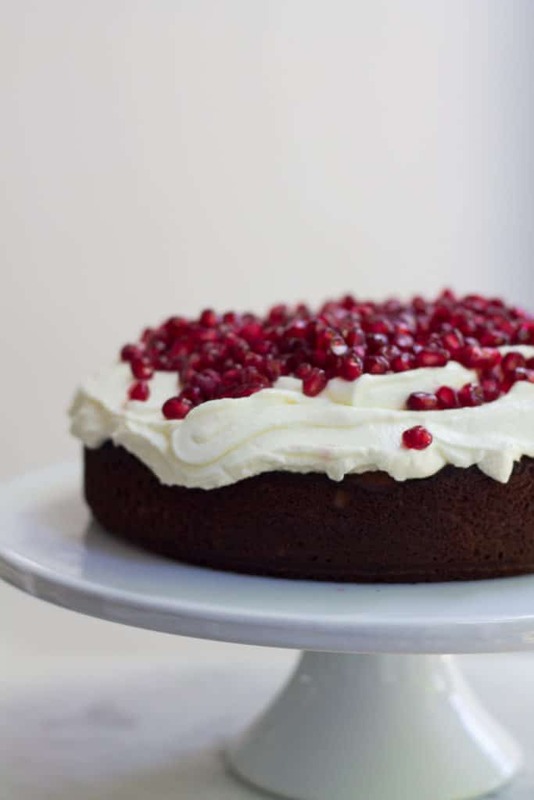 I suggest you get the thickest, creamiest Greek yoghurt you can find for the topping on this. However, if your supermarket doesn’t stock Greek yoghurt then I suggest you buy about 800g-1kg (1.8-2.2lb) of plain natural yoghurt. The night before line a sieve with three layers of cheese cloth and rest the sieve over a bowl. Mix a teaspoon of lemon juice and a pinch of sea salt into the yoghurt then spoon on to the cheese cloth. Leave in the refridgerator for 8 hours or overnight. The watery whey will drain away from the yoghurt leaving you with a thick, creamy cheese/yoghurt (labneh). This is actually such a delicious thing to do, I recommend you give this a go if you have time one day. Note 3. 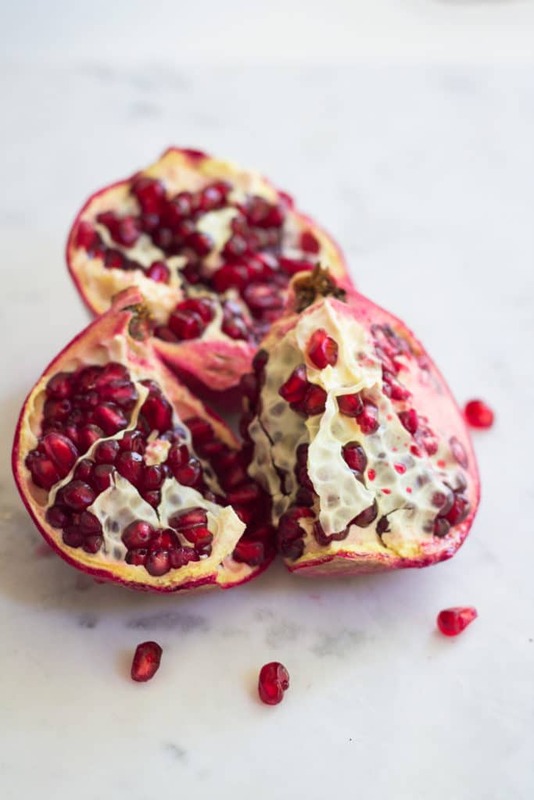 The easiest way to get the seeds out of a pomegranate is to fill a large mixing bowl with cold water. 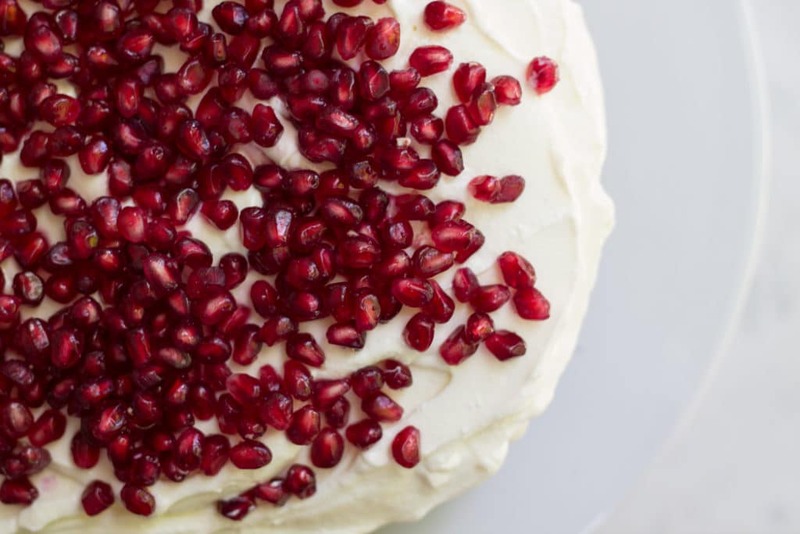 Break open, or cut open the pomegranate and put in the water. Using your hands remove the seeds in the water and you will find that magically the seeds will sink to the bottom and the pith of the pomegranate will float! If you make this, I would love to see! Tag your photo with #mylittlelarder on Instagram or Facebook. or leave a comment and some stars below!